Emergency Services & Data RecoveryClear and practical advice. Cyber security is a hot issue. But why is it important to someone who runs a business? Because you’ve worked hard to build your business. To serve your customers. To win new business. Yet it all can be stolen from you. Years of hard work down the drain — if you don’t understand the business impact of cyber security. We created this guide and aimed it at business managers and owners. It’s short, factual and practical. 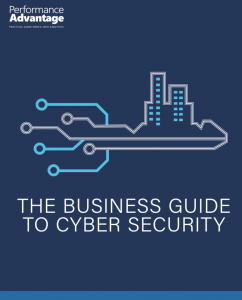 It will give you the basics that you need to understand why cyber security is important and what you need to do. It’s not “for dummies” — if you’ve built a business, you are no dummy. It’s written in the language of business, not “techno-speak”. And we did that intentionally because while some technical skill is required, you are the one who knows your business. Enter your information below to receive this report by email as well as emails about other product and services offerings that may be of interest to you from Performance Advantage. This promotion is brought to you by Performance Advantage. Performance Advantage is obtaining your consent to send electronic messages to you. Your information will not be shared outside Performance Advantage, and you can unsubscribe from emails sent by Performance Advantage by clicking on "Unsubscribe" on any email received.